At times you need to know when your ASP.NET Core web application is being started and shutdown. One of the lesser known features of ASP.NET Core is the IApplicationLifetime interface that allows you to wire some logic when such application lifetime events occur. This article briefly discusses the IApplicationLifetime interface and its functionality. ApplicationStarted : This property can be used to hook a callback that is executed when an application host is started. ApplicationStopping : This property can be used to hook a callback that is executed when an application host is about to stop. Some requests might be pending at this stage. ApplicationStopped : This property can be used to hook a callback that is executed when an application has been stopped. All the requests are complete at this stage. StopApplication() : This method allows you to shutdown an application programmatically. You might use these callbacks to flush out logs or send some notifications. These three properties are actually CancellationTokens and allow us to register Action callbacks. Remember that StopApplication() should be used with caution after evaluating the consequences as it shuts down the current application. The IApplicationLifetime is registered with the DI container. You can inject it in Configure() or some controller. Ok. Let's create a simple ASP.NET Core MVC application that illustrates the usage of these properties and method. As an example we will log messages in a text file to confirm that a particular callback has been called. The Configure() method receives an object of IHostingEnvironment. We store it in a private variable for later use. We need this object because we want to compute the log file path in the callback methods. The callback method shown above simply log messages with timestamp to a text file named AppLog.txt. To test the application, run it and then after some time close it using the system tray (IISExpress) or by pressing Ctrl + C in the console window (Kestrel). In the preceding application run you initiated the application shut down manually from system tray or console window. You can also stop an application using StopApplication() method of IApplicationLifetime. The view outputs a timestamp stored in IMemoryCahche. We do this just to confirm that the application has been stopped and IMemoryCache is emptied. To modify the application open the Startup class and add this line to ConfigureServices(). The Index() action simply checks whether an entry named timestamp exists in the IMemoryCache or not. If it doesn't exist, a new entry is added otherwise the existing entry value is assigned to the ViewBag.Message. 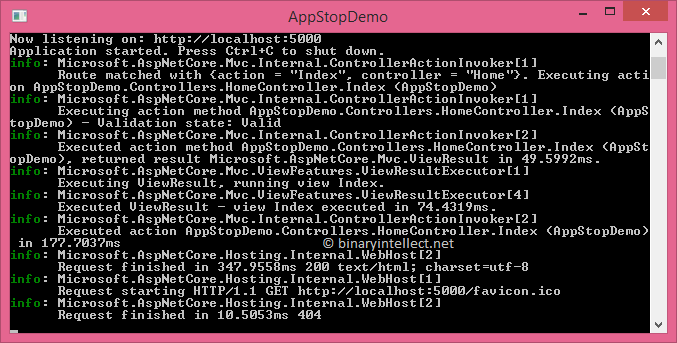 The Stop() action calls StopApplication() method of IApplicationLifetime. This causes the application shutdown. The action also returns a message to the browser accordingly. If you hit the application URL by opening a new tab, the application will be started again and you will get a new entry in the IMemoryCache (since the cache got emptied with the app shutdown).